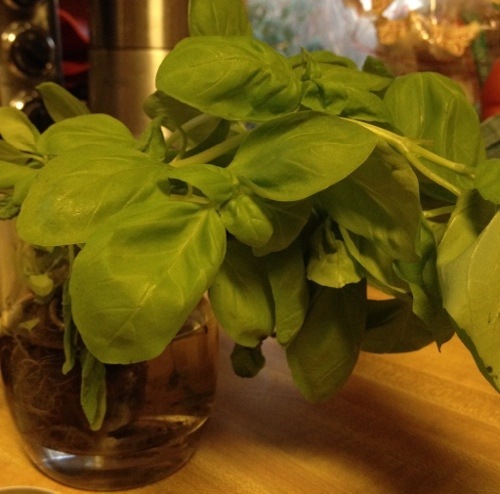 Growing basil indoors in the winter gives me fresh basil to use to make pesto. There is no denying that I would like this dish even better in the summer and fall when I have my own broccoli and tomatoes to use, but since I love my tender little basil leaves, I will post it now. 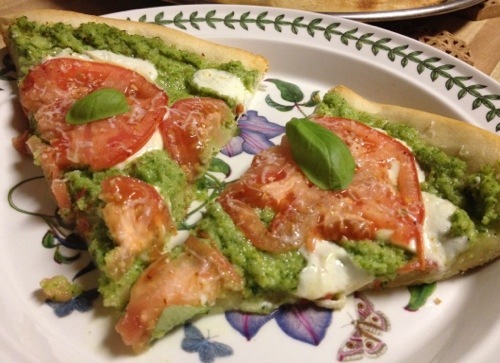 This isn’t your mother’s pesto pizza, it is Broccoli Pesto Pizza. 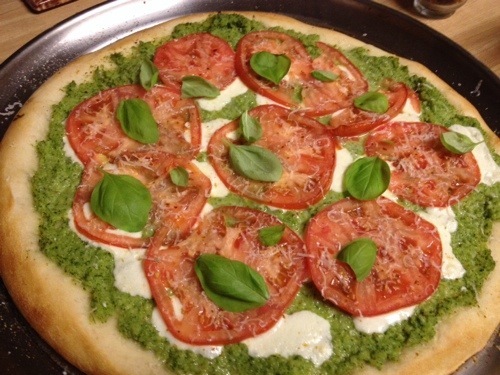 I have adapted a recipe by Ellie Krieger in Food Network Magazine to better fit my family’s tastes…fresh mozzarella (not goat cheese) and adding garlic to the pesto. I think next time I will add some sun-dried tomatoes on top as well – my husband and I looked at each other as we ate it and both thought that sun-dried tomatoes would be a perfect addition. It is a feel-good dinner. It’s pizza, and who doesn’t love pizza? But it is also incredibly healthy. So, enjoy!!! If using frozen broccoli, thaw according to package directions. 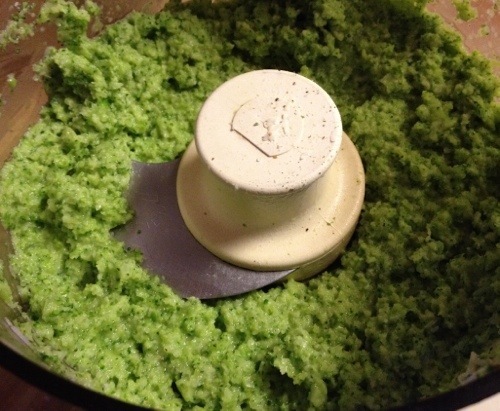 In a food processor, add the broccoli, garlic, 1/3 cup parmesan, 2/3 cup basil, 1/4 tsp salt and 1/4 tsp pepper. While the processor is running, drizzle in the olive oil. Process until smooth, scraping down the sides of the bowl as needed. Spray a pizza pan or baking sheet with cooking spray, sprinkle with cornmeal. 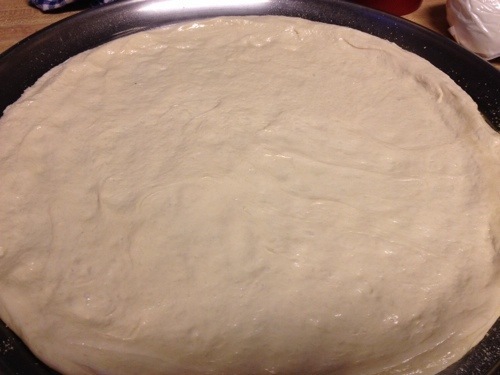 Place the pizza dough in the center of the pan and use a rolling pin or your hands (I used my hands and it worked great) to stretch the dough into a 12-14 inch circle. 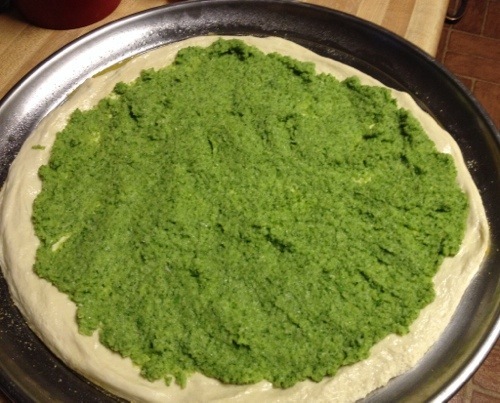 Spread the broccoli pesto over the dough, leaving a border for the crust. 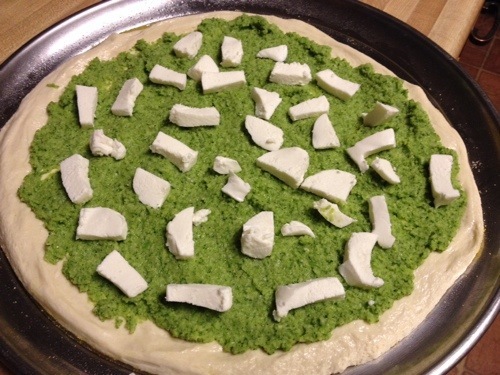 Scatter the cheese on top of the pesto. Arrange the tomato slices on top. 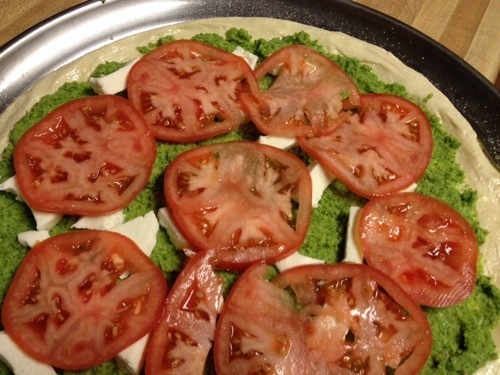 Bake until the cheese and tomatoes are softened and the crust is golden brown, 12 – 14 minutes. Garnish with remaining parmesan, basil and the red pepper flakes. Slice into 8 wedges and enjoy!